Yerba Buena is a Spanish restaurant in Madrid which specialises in fine vegetarian dining, which is something of a rarity in Spain. Located near the historic Plaza Mayor, this restaurant stands out as a fresh and modern restaurant that serves fresh and modern food. Yerba Buena is a vegetarian restaurant which was set up by its owners who were tired of working in restaurants that always seemed to end up being the same. 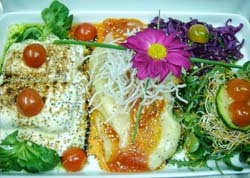 They therefore decided to open a restaurant that appealed to both of their passions: cooking and vegetarianism. They took a personal part of themselves, which they usually left at home when they worked at other more traditional Spanish restaurants, and made it into something that they could share with others. As soon as the restaurant opened, its founders found a great sense of relief and happiness in being able to explore their passion for vegetarian food further. However the Yerba Buena is not a 'vegetarians only' establishment. The owners welcome all customers from all walks of life as they revel in the challenge to try and surprise someone with their fine vegetarian dining which breaks the stereotypes of this type of cuisine. It is for this reason that they have made it into the Spain city guide books. The focus of the Yerba Buena's decor is on fresh and fruity colours. The shop front of this Spanish restaurant is painted in bright, lime green which makes it stand out from its competition. The green continues inside as the wood cladding which reaches half way up the walls is also painted in this colour. The green is complemented with a pale yellow on the rest of the walls which keeps the dining rooms light and airy. Around the walls there are natural elements which help tie into the overall theme of the restaurant including decorative bamboo plants and baskets of fruit. The tables are always set beautifully and the jolly, fruit themed placemats keep the atmosphere at the Yerba Buena fun. Yerba Buena in Madrid provides the best vegetarian food in Madrid, and not just because it is one of the only vegetarian restaurants in Madrid. 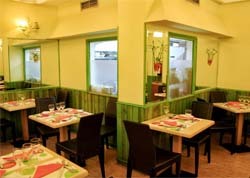 The company's slogan, 'alta cocina vegetariana' or 'vegetarian 'haute cuisine'' accurately defines what the owners have tried to achieve with the restaurant. After being vegetarians themselves for many years, the owners wanted to show the endless possibilities that are available to vegetarians and to break the stereotypes which often surround this kind of food. Along with the help of their expert kitchen team, Yerba Buena lives up to its motto with a large menu that consists in some excellent dishes. Many of the dishes have an oriental base as the majority of the kitchen team members are from East Asia. Some of the highlights of the menu at the Yerba Buena restaurant include 'pastel de espinacas y puerros' (Spinach and leek tart), 'paella vegetariana de hortizas' (Vegetarian paella made with garden vegetables), and 'hamburguesa de soja texturizada a las finas herbas' (Soybean burger textured with fine herbs). A large number of the meals on offer are also available for vegans and people with other special dietary needs. All of the dishes at this Spanish restaurant are presented beautifully in a modern style. They are often decorated with fresh herbs and spices and sometime fresh flowers. For all of those with a sweet tooth out there, the Yerba Buena has an excellent range of desserts available, many of which are available for vegans too, and include dishes such as 'pastel relleno de compota de manzanas' (Tart filled with ample compote), 'tarta de chocolate' (chocolate cake), and 'helado artisano de jengibre' (artisan ginger ice cream). They also offer a large range of coffees and herbal and fruit teas which are the perfect ending to any meal. Aside from the main menu, Yerba Buena offers a number of set menus including a daily menu, a children's menu and a special occasion menu - all of which offer great value for money. They also have a menu of the month which is based on products which are in season at the time. Furthermore, the restaurant opens for breakfast and lunch and has a wide range of snacks and other dishes tailored to these mealtimes. 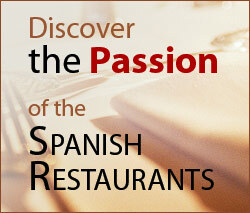 This means that the restaurant is perfect to enjoy at anytime of day when you visit Madrid.